Recycling is nearly a national pastime in Germany. There’s a blue bin for paper, a brown or green bin for biodegradables, a yellow one for plastic and a black one for the rest. Additionally, Germans return their deposit bottles to the supermarket, and drop glass bottles at public collecting points. Germans are proud of their recycling system. Even children’s books spin the tale of the colored bins. Indeed, the nation is celebrated as a recycling role model around the world. When Germany introduced its recycling system with the “green dot” as a symbol in 1991, it was unparalleled. Today, 29 European countries along with Israel and Turkey have adopted the green-dot system, where companies pay a fee to finance the collection, sorting and recovery of packaging waste. And Germany retains its good reputation. In 2017, the World Economic Forum named the country recycling world champion. Yet experts argue that Germany doesn’t actually recycle as much waste as statistics suggest — especially when it comes to plastic packaging. Globally, we generate about 1.3 billion tons of trash per year. In Germany alone, this amounts to a whopping 3 million tons of plastic packaging waste annually. According to official statistics, 48.8 percent of that plastic waste was recycled in Germany. But that figure is deceptive, says Philipp Sommer, a circular economy expert with the German environmental and consumer protection association Deutsche Umwelthilfe (DUH). “We assume that only 38 percent was actually recycled,” he told DW. Germany is not alone in opaque statistics. The lobby group Plastics Recyclers Europe says that reported recycling rates across European countries don’t reflect how much material is actually recovered. “The numbers are based on the amount of plastic waste collected rather than the amount of plastics finally recycled,” Antonino Furfari, managing director of the lobby group, told DW. Furfari says that the net recycling rate of countries with high reported numbers — including Germany, Lithuania and Slovenia — are actually much lower, for several reasons. First of all, a lot of the waste that ends up in sorting facilities has been wrongly collected. In big cities in Germany, up to 50 percent of general rubbish ends up in the yellow bins designated for plastic, including packaging waste that needs to be separated from the valuable plastics. Secondly, plastic packaging is often made from a variety of polymer types. For example, meat packaging includes several protective layers to avoid discoloration of the contents, although only single-variety plastics can be recycled. Automated facilities are unable to sort food containers made from different types of plastic, resulting in much mixed plastic packaging ending up being discarded, explains Franziska Krüger, an expert for plastics recycling at Germany’s environmental protection agency, Umweltbundesamt (UBA). “It’s not easy to recycle plastics because there are many different types of materials, and the combination options are high. This minimizes the recyclability,” she told DW. Another oft-forgotten fact about recycling is that the recovered material degrades in quality. Recycled plastic packaging can therefore not simply be used to produce new packaging material. Recycled plastic bags, sandwich wrappers and juice bottles are typically turned into flower pots, coat hangers and other products that don’t require high-quality material, such as that associated with food. In order to produce new food packaging, the industry needs to add new material — namely crude oil — “which unnecessarily uses loads of resources and harms our environment,” says Sommer. “We only have ‘real’ recycling with reusable bottles that are collected [from consumers with help of a deposit system] via supermarkets,” he adds. Bottles made of polyethylene terephthalate — or PET — can be cleaned and refilled 25 times before they get recycled. Glass bottles can see 50 uses or more before they need to be recycled. Read more: Plastic bottle recycling champion: Norway or Germany? Germany does have the biggest collection system for reusable PET and glass bottles worldwide. “That’s something we can be proud of,” says Sommer, adding that an ongoing trend, however, is moving toward single-use bottles instead. Plastic is cheap, robust and lightweight. It has transformed the way we consume — and in short, made our modern lifestyle possible. Packaging based on synthetic polymers has allowed supermarkets to offer a wider range of fresh produce that stays fresh longer. Computers, toothbrushes and synthetic clothing contain plastic. Modern medicine has also greatly benefited from the disposable plastic syringe. But our dependence on plastic is problematic. Microplastic has been found in Antarctica and the Arctic, not to mention tap water worldwide. A study from 2016 has warned that unless the world takes drastic action to recycle, there will be more plastic than fish in the world’s oceans by 2050. Since mass production began in the 1950s, we’ve produced 8.3 billion metric tons of the material — and demand continues to grow. In Europe, the amount of plastic waste has increased 13 percent in the last 10 years, mirroring a worldwide trend. Although some talk of turning back the clock to a pre-plastic era, plastic’s ubiquity in our modern lives would make this a huge challenge. 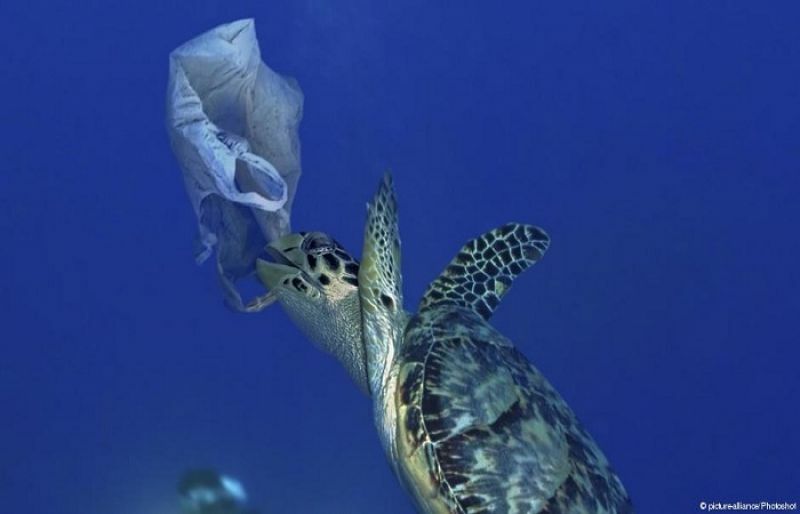 Since the explosion of the plastic pollution problem, its very visible nature has seen it gain attention. Recently, much public discussion has focused around reducing plastic use, developing alternatives to plastic, and increasing recycling rates. Many experts and politicians believe the answer lies in a circular economy. By “closing the loop,” less plastic packaging waste would end up in landfills, incineration plants or the ocean, and we would save valuable resources while protecting the environment, points out Mathy Stanislaus, a circular economy expert at the World Resources Institute. If we continue producing and discarding as much plastic as we do now, by 2050 the plastic industry would eat up 20 percent of all crude oil production, consuming 15 percent of the global annual carbon budget. “In a circular economy, we would reduce a number of environmental impacts, including greenhouse gas emissions,” Stanislaus told DW. Even in a circular economy, the public continues to play a crucial role in the recycling system, says Krüger. “Sorting facilities rely on consumers. It’s important to say: Please help and contribute,” she says. Recycling should remain a national sport in Germany, she says. And hopefully become one in other countries, too.